Below you will find examples of the types of axes I make. They can be either sharp for living history displays or blunt for combat. They are made in the traditional manner by folding a billet over on itself and hammer welding shut. I do not fabricate or cast these heads. 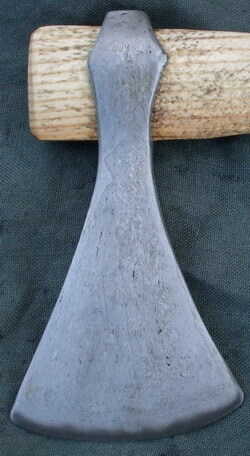 A Petersen type "A" axe head with an ash shaft. The head is made by folding an iron rod over on itself and welding the two sides together. The fold is left open and the eye is drifted open with a former. A steel edge is hammer welded between the two iron laps. This example is based on a surviving axe head found on the Isle of Man. 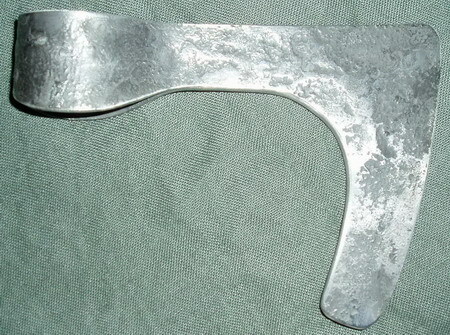 This is a Petersen type "E" axe head, one of the most common 8th-11th century types of axe head. It has a short beard (skeg), weighs 350g and is blunt for use in combat. 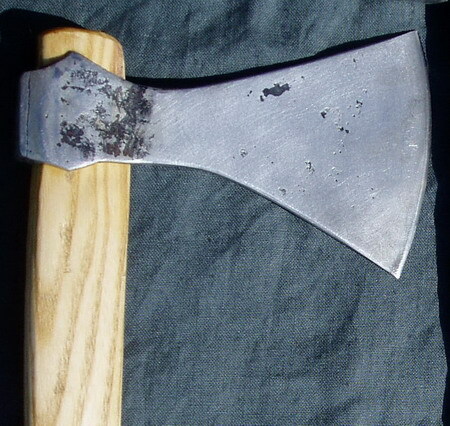 This is a Petersen type "K" axe (that is a non bearded axe with an asymmetrical blade). It has a wrought iron body with a carbon steel edge insert and an ash wood haft. The end on view shows the steel edge insert as a dark band against the light grey of the wrought iron. This effect can be highlighted by the use of acid, alternatively I can supply it with an abrasive finish which gives it a matt grey surface. This is a Petersen type "C" axe head, 8th-11th century and has a long beard. It is available in two weights, 350g for show fighting and 200g for competitive fighting. 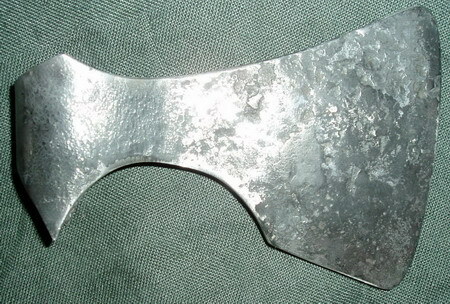 Thames Pattern Dane Axe 10th 11th Century. This axe is made of layered iron with a steel insert edge. The iron is forged to a roughly shaped billet which is then folded over and around a former to give the eye. It is welded together into the body leaving about an inch unwelded along the edge. The steel edge is forged into a curved wedge section and it is then placed between the unwelded edges and the whole is hammerwelded shut. The head is then forged, the eye drifted out and it is ground and polished. 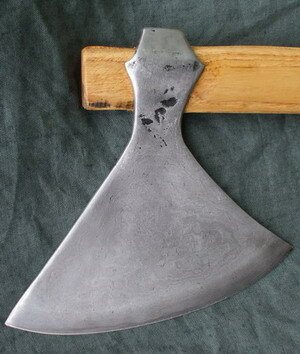 Notice the dished effect into which the head is forged and ground leaving slightly hollow sides to reduce the weight - the edge appears as a ridge . The steel can be seen as a wavy line contrasting with the lighter coloured iron of the body. The head is mounted on an ash wood shaft. Copyright © Paul Binns 2011. All rights reserved.